The Queensland Rail Project was the first project to use the BinSafe brand name. We began supplying recycle bin enclosures for QR stations in 2009. The Queensland Rail Project was the first project to use the BinSafe brand name. 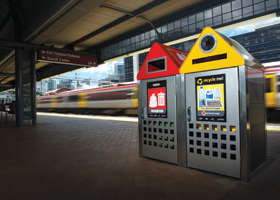 We began supplying recycle bin enclosures for QR stations in 2009. QR had embarked on a refurbishment of their City Rail stations, and elected to use our design. These were made from a combination of stainless steel and 60% recycled material and were designed specifically to meet Queensland Rail’s rigorous safety requirements. Working closely with QR staff and Greeneco, we were able to design a stylish, environmentally friendly and safe product. This project has since lead to an expanding of the range and sales to other high profile customers. We are grateful for the trust placed in us as a disability organisation by QR and we look forward to a long-term relationship with them.